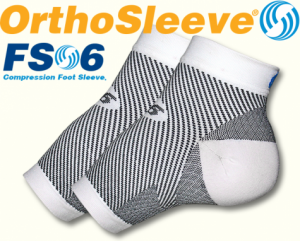 The OrthoSleeve FS6 Compression Foot Sleeve has innovative orthopedic support that relieves Plantar Fasciitis, eases foot pain and swelling, improves circulation, and aids muscle recovery for a more fulfilling, active lifestyle. The foot sleeve is thin and light with an easy-on fit and moisture wicking materials. It features six zones of gradient compression that adjusts from light to moderate to firm in a coordinated design.